Imagine Dragons has just invested in a company called ReKTGlobal. This means that Imagine Dragons will partially own all of ReKT’s previous investments, a major one being Team Rogue. In simpler terms, the group members of the popular music band are now all part owners of Team Rogue. The deal is extremely big news as no major music giant such as Imagine Dragons has ever made a commitment to esports. This may very well pave the way for other music stars to enter the esports industry – these are truly exciting times. It is unknown the amount Imagine Dragons has invested into ReKTGlobal, but considering the bands’ size, it is likely they decided to take a decent share in the org. If you think this name sounds familiar to you, you’re probably right. Imagine Dragons are one of the biggest bands in the music industry, having sold over twelve million albums and thirty five million singles worldwide. Through their success, they have amassed over eleven and a half million subscribers on YouTube, six million follows on Twitter and thirteen million likes on Facebook. Even if you are not a big music fan, and consider yourself a League of Legends veteran, chances are, one of their songs will sound extremely familiar to you – Imagine Dragons produced and sang ‘Warriors’, the theme song for the 2014 League of Legends World Championships. They were essentially, the first big ticket artist Riot had commissioned, ‘Warriors’ now having over one hundred and thirty three million views on YouTube alone! 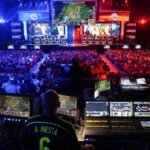 ReKTGlobal are an esports company currently co-owning massive gaming organisation ‘Rogue’ along with musician Steve Aoki. On top of Rogue, ReKTGlobal manages a “50-person stream team”, a decent share of Twitch’s streamers. Being a large esports organisation, Rogue has teams, individuals and streamers in the following games; CS:GO, Rocket League, H1Z1, PUBG and Fortnite.While Rogue does have their hands in a few games, their organisation is most well known for their venture in CS:GO. While they haven’t won any big international tournaments, they are by no means an unsuccessful team. Rogue’s CS:GO team has taken out the ESEA Season 23: Global Challenge and made an appearance in the ESL Pro League Season 6 (North America) & ESL Pro League Season 7 (North America).